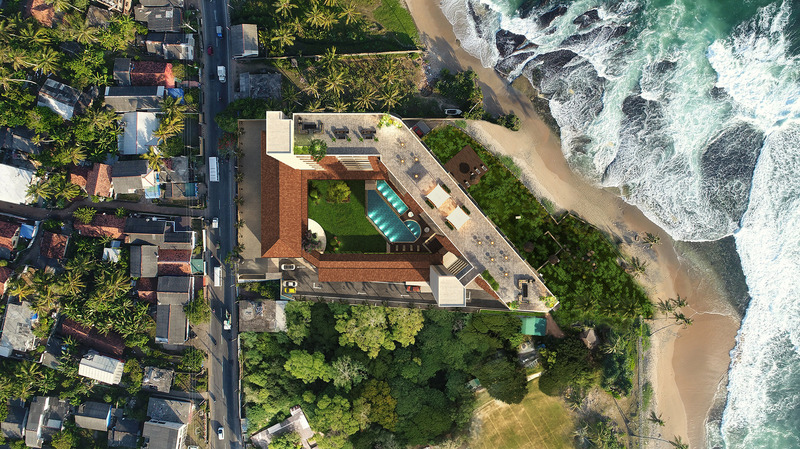 OceanFront Galle,New Pinnacles in Luxury Beach front Residential getaways Experience exceptional places of luxury and enjoy life’s riches everyday while sulking in the serene tranquility of the clear blue sun and sea. 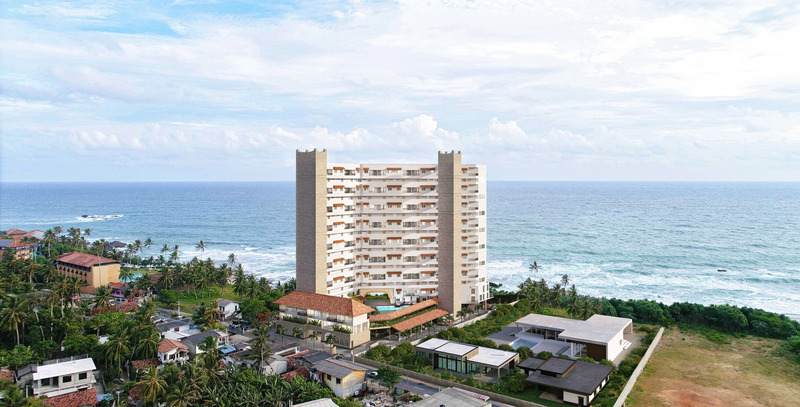 Welcome to Ocean Front Condominiums in Galle, more commonly known as the ‘Beach Capital’ in Sri Lanka. 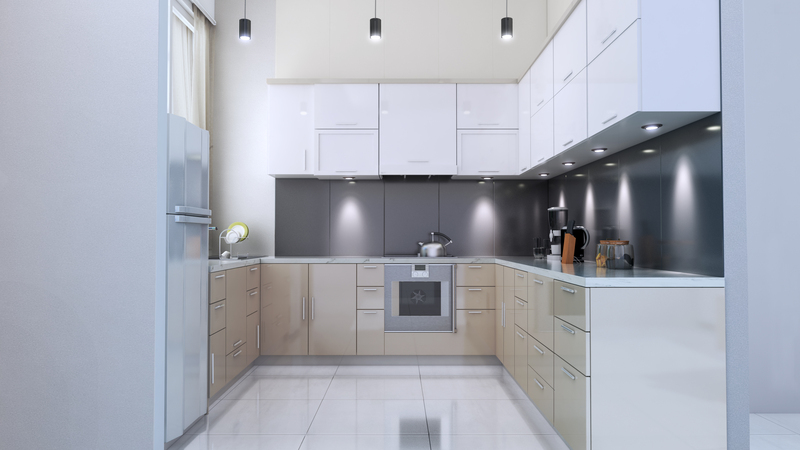 These 92, 1/2/3/4 BHK luxury simplex and duplex apartments offer you an elegantly designed and thoughtfully planned home – one where every comfort is taken care of. Nestled within panoramic surroundings, with swaying coconut palms waving out to greet you to the horizon where the sky and sea touch, you will find yourself lost in the beauty that stands before you. Lush green gardens, the gentle ripples on the surface of the pool, the heady fragrance of the flowers all around, the birds chirping from the trees – an enchanting and idyllic paradise awaits. 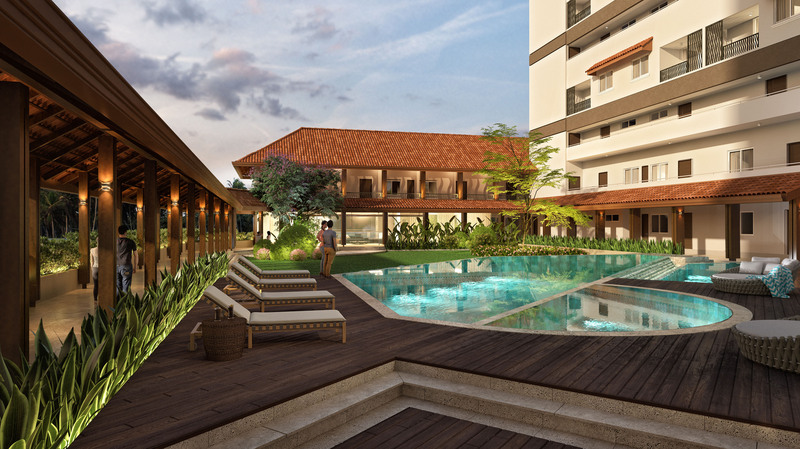 These luxury apartments in Galle combine a perfectly planned layout with the complete infrastructure that is needed for a hassle- free lifestyle. 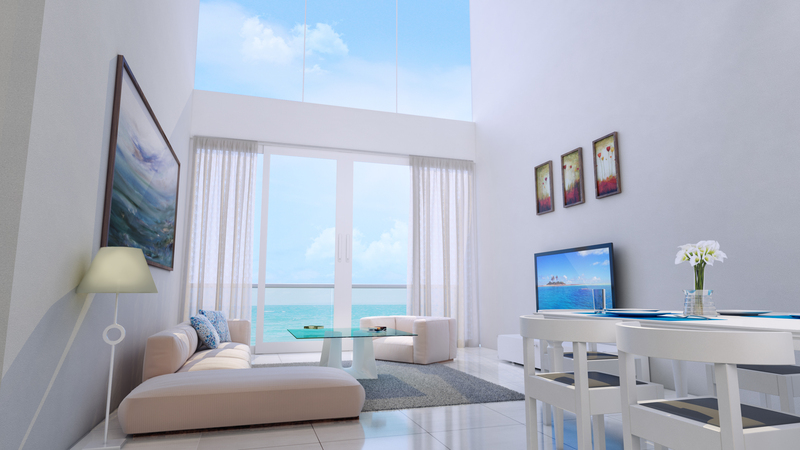 Due in part to the mixed blend of contemporary engineering with colonial type architecture, every apartment offers voluminous expanses of unblemished living space to enjoy Enjoy the best of both worlds – nature at its finest and state of the art amenities which leave nothing to be desired. 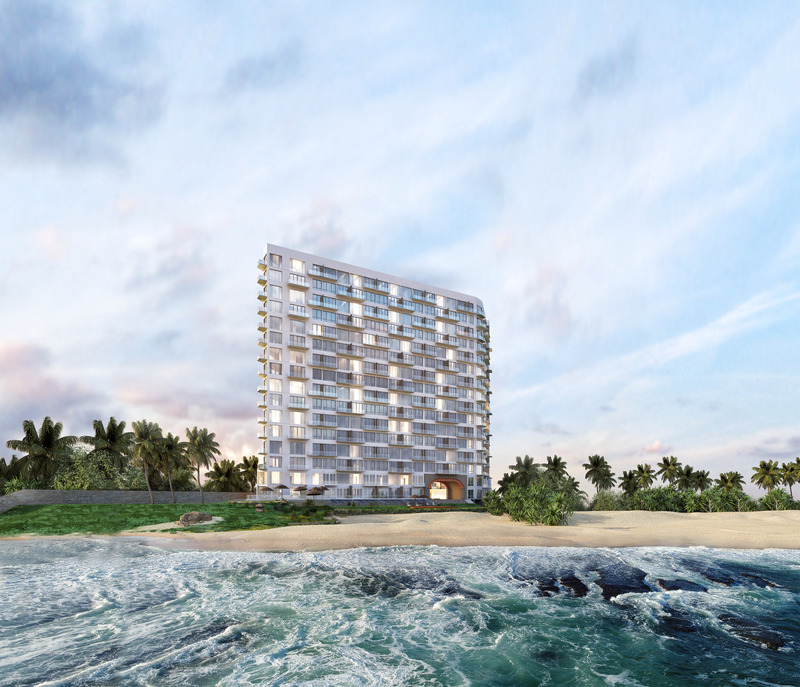 Ocean Front Condos Galle's promise of excellence is firmly stamped on each of these luxurious apartments. Look forward to being a part of a stylish, exclusive and contemporary home – one as unique as you are. Masonry block and plaster. External weather shield paint, internal emulsion paint. Gypsum board ceiling with metal framework. 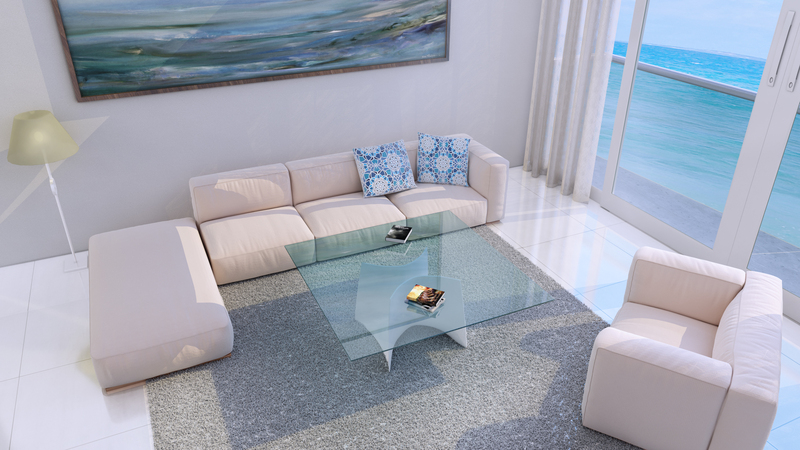 Porcelain tiles in sitting and dining areas. Porcelain tiles in living and bedroom areas. Solid timber paneled door for main door and engineered timber doors for interior doors. White powder coated aluminum frames with tinted glass. Composite wood cabinet with acrylic top. Porcelain ﬂoor tiles and ceramic wall tiles up to ceiling level. Glass shower cubicles and ceramic ﬁttings. 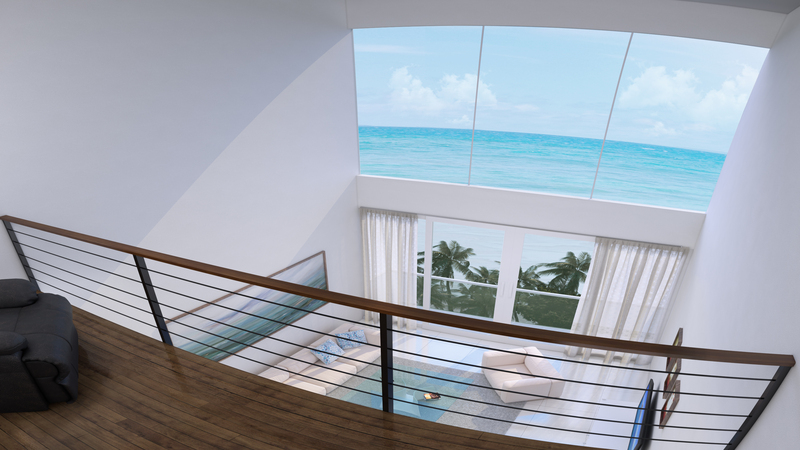 Toughened glass handrails in front balconies. Three phase power connection and standby generator system for full electrical demand. FTTH for voice, data and television. Wet riser system, refuge area, heat detectors in kitchen and ﬁre extinguishers in ﬂoor lobbies. Air conditioned space in living and bedrooms. Ventilation for kitchen area. Two elevators for passenger transport. CCTV monitoring in lobby areas, entrance and exits. Fresh water swimming pool, gymnasium and café. Garbage collection room to dispose garbage after separation. International Construction Consortium (Pvt) Ltd.
Our strong reputation, backed by nearly 4 decades of successful construction solutions to the nation, has made ICC, a name synonymous with exceptional quality of service. Established in 1980, International Construction Consortium (Pvt) Limited (ICC), has become one of the largest and most respected Civil Engineering Organizations in Sri Lanka, with the promise of distinct service, experienced staff, a fleet of plant and equipment, the highest quality materials and a reputation for successfully integrating these aspects, to ensure the timely completion of projects. The Company holds the highest CIDA Grading CS2 for the major areas in the local construction, including Buildings & Highways and holds ISO 9001, 18001 & 14001 certifications. Our diverse range of services include Building Construction, Roads & Bridges, Water Supply & Sanitation, Architectural & Structural designs. The Company successfully penetrated the property development market in 1999 by establishing a number of fully-owned subsidiary companies, including ICC Housing (Pvt) Ltd, Nivasie Developers (Pvt) Ltd, ICC Development Holding (Pvt) Ltd and ICC Developers (Pvt) Ltd. ​ With a strong penchant for finding opportunities for expansion and diversification, the Company has expanded into Readymix concrete, Pre-cast concrete products, aluminum & steel fabrication, prefabricated housing, fully automated timber production and multiple interior wall partition solutions.